Super Clear Quartz point with multiple Green (Chlorite) Phantoms. This gorgeous Phantom point has the additional benefits of having a beautiful light-bearing rainbow at its heart. There is also a little bit of white calcite lodalite in it too, at the rear of the crystal. Phantom crystals are ones which have a 'ghost-like' crystal inside of them - and when found in a point, this 'ghosting' is the same shape as that of the outside of the crystal. Phantoms store information gathered over millenia and are, therefore, super for helping us access the Akashic Records. They are first rate at activating a person's healing abilities by assisting connection with spirit guides, so are of great use to healers old and new. As an example, if a healer or alternative practitioner felt that their energies may have become a little low, try working with a Phantom crystal to get reconnected. Judy Hall in the Crystal Bible says that Green (Chlorite) Phantoms help with self realization and the removal of energy implants, but the latter should only be done under the guidance of a qualified crystal healer or therapist. 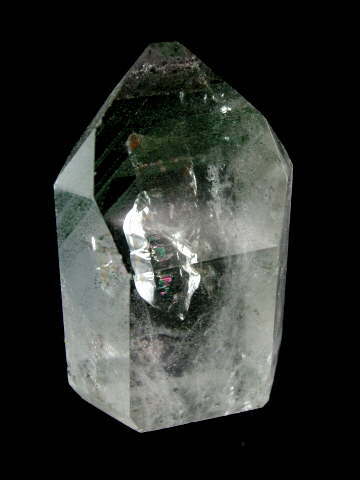 Chlorite is considered on of the master healing crystals (technically a mineral). It's a positive, powerful healing stone, beneficial for your environment or personal energy field. Placed with a piece of Carnelian and Ruby, it protects against psychic attack and can help earthbound spirits move on into the light. Rainbow crystals manifest pure white light, bringing the Universal light into the earth plane. They are some of the most uplifting, joyous crystals to have around, especially on a sunlit window sill were they can channel their beautiful energy into our homes. They can bring clarity to our dreams and can help dispel negativity, replacing it with pure untainted light.